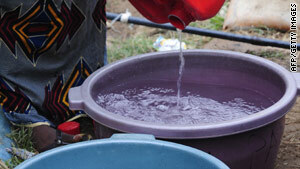 Many people living in the country's far north region do not have access to potable water. (CNN) -- Cholera has killed 200 people in the west African nation of Cameroon, the government said Thursday, and aid agencies feared the outbreak could spread to neighboring regions and nations. Another 2,500 cases of cholera, a deadly water-borne disease, have been diagnosed in Cameroon since an outbreak warning in June. About 70 percent of people living in the country's far north region, bordering Nigeria and Chad, do not have access to potable water, according to a Ministry of Water and Energy official. Sanitation is also limited in the area and recent flooding has aggravated the situation. UNICEF said it has dispatched emergency medical kits containing surgical gloves, water treatment tablets, cholera medicine, oral rehydration salts and educational materials. The United Nations children's agency said the outbreak could be devastating for children, who are especially vulnerable. The disease is caused by contaminated water, and many people with cholera suffer acute watery diarrhea, which leads to severe dehydration. If left untreated, it can kill quickly, possibly within hours, according to the World Health Organization. Up to 120,000 people die each year from cholera. Journalist Moki Kindzeka contributed to this report.